A quilt that has been on my to-do list for some time, and again the units are simple ~ a traditional Drunkard's Path block and a patchwork square ~ as is the layout. Until last year my curve sewing skills were limited and I am glad that I've found a piecing method for Drunkard's Path units that suits my style of sewing: oversizing, no pinning, and trimming for accuracy (see also No-Pin Drunkard's Path Block Tutorial). This is quite possibly a longer and more time consuming process, but let's face it, I am just not a pinner, and this method not only works well, but I actually enjoying the piecing. Choosing fabrics was, and it always is, a highlight. The color palette for this quilt is a little bit different to what I normally work with, choosing stronger, saturated colors over softer, pastel colors. It took all of my efforts to stay away from my stash of pink fabrics! 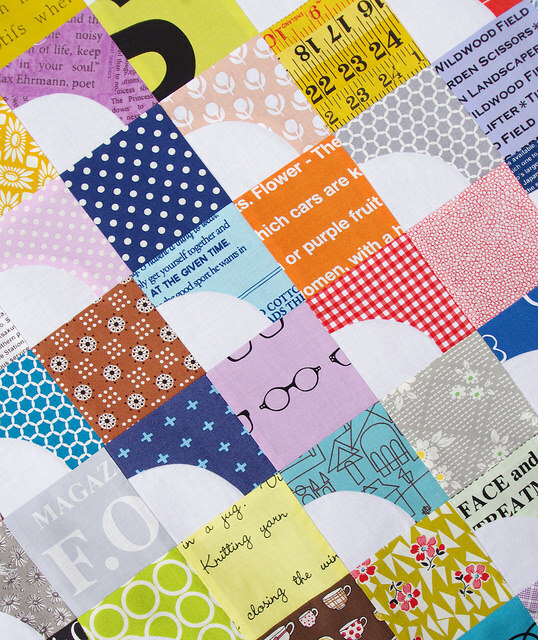 This was also a great opportunity to work with my stash of text fabrics, and many of the text prints used are from the First of Infinity Collection by Kumiko Fujita. I love that you can fussy cut these designs to vary the scale of the text as well as the background color of the fabric. 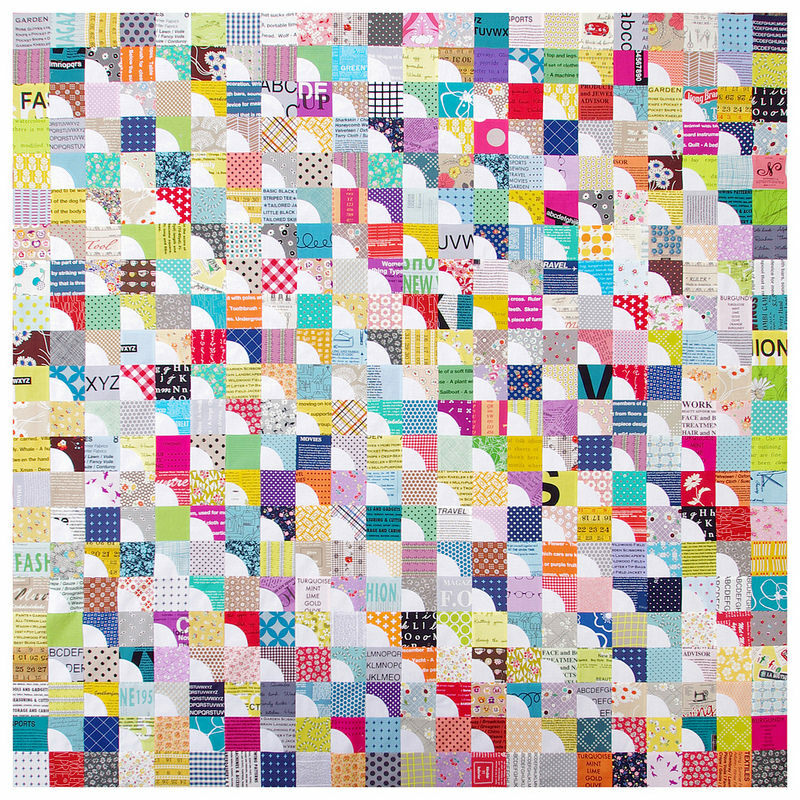 Several of the fabric panels are multi-colored and perfect for fussy cutting ~ one fabric, 8 or more different colored squares. All other fabrics are from stash, several pieces have been rescued from my scrap bin. Choosing and cutting fabrics was very time consuming, and took longer than expected. This is one aspect of the quilting process I tend to underestimate. The actual sewing rarely takes as long as pulling fabrics from stash and cutting, then returning the fabric to stash in an orderly manner. Quilt measures 66.5 inches x 66.5 inches. 22 rows each of 22 blocks. 200 Drunkard's Path Blocks each measuring 3.5 inches x 3.5 inches incl. seam allowances. 284 patchwork squares 3.5 inches x 3.5 inches incl. seam allowances. is Robert Kaufman Kona Cotton in white. 120+ different fabrics (a conservative estimate). Thanks for sharing the tutorial! 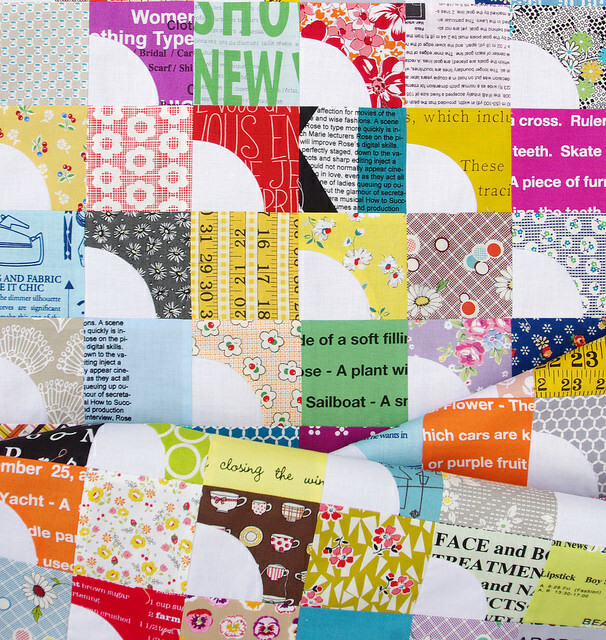 I've not been a big fan of curved/pinned piecing, but I'd like to try this method. 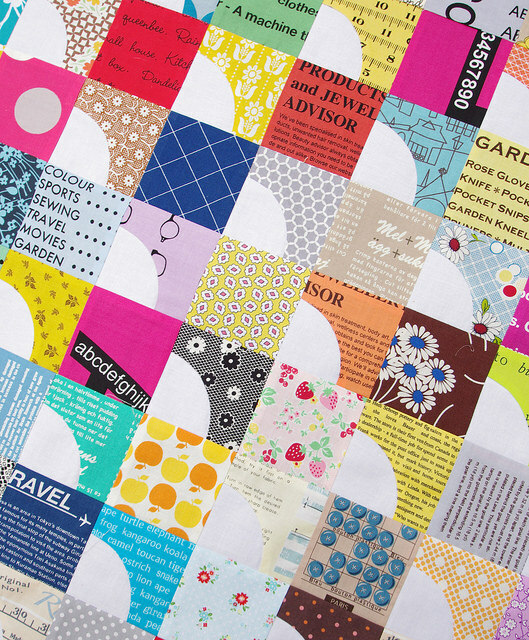 Wonderful quilt with great fabric choices! Beautiful. Have you ever used so much white before? I'm trying your tutorial today. I think my work has seen a shift from the use of a lot of solid white fabric to low volume fabrics (printed fabrics with a light/white background). I was going to comment that I see a lot of those first of infinity fabrics in there but you wrote about that! I like how they work so well with a variety of fabrics. I ordered a few of the new 2015 prints! Suchba great design, I love this quilt Rita! That block layout would look great on point too. Your method of making the drunkard's path is next on my list...but I have so many other things to finish first! Really love the colors of this quilt! Rita, I love this quilt! I think of this pattern as so "old-fashioned" but you've chosen just the right colors to wake it up! And those white pieces are an inspired choice--just pops everything! Congrats! What a wonderful quilt! I am enjoying your selection of unique fabrics & colors. I think your use of white sets those colors & fabrics off beautifully. Thanks for referencing the no pin tutorial! It is just what I need.! As always, your fabric choices are great! I agree with your piecing method. 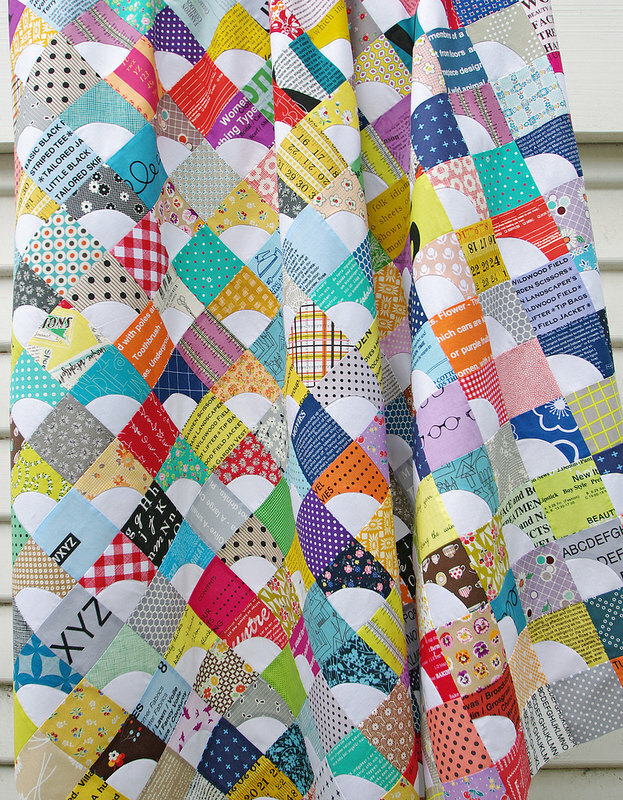 I just made my first quilt using drunkard path block. I was following a pattern from Quilters mixology book and found I didn't have room to trim down my blocks. If I were to make another quilt I would definitely increase the size so I can square the blocks afterwards because I also found the no pin method the easiest but my blocks weren't perfect . 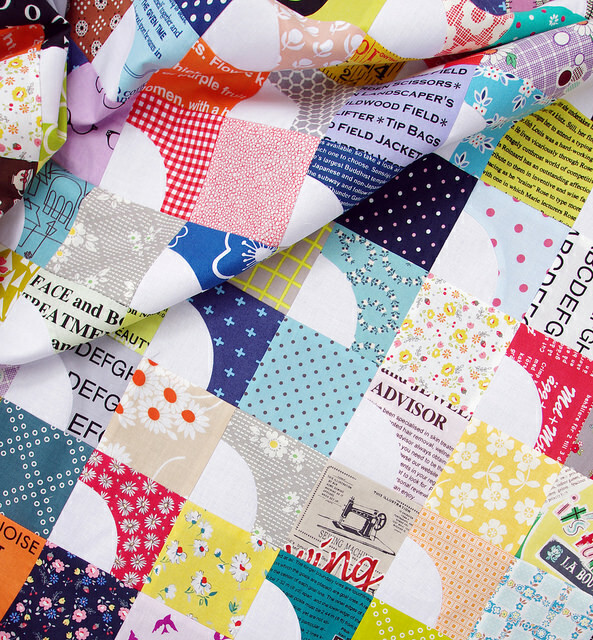 :) Love your fabric choices in the quilt. Beautiful. Terrific quilt! You've done an amazing job with all those perfect little curves Rita! The fabrics you use are an awesome combination, as always! Girl, do you have it right about prep and put away taking a lot longer than one would expect. That gets me every time. 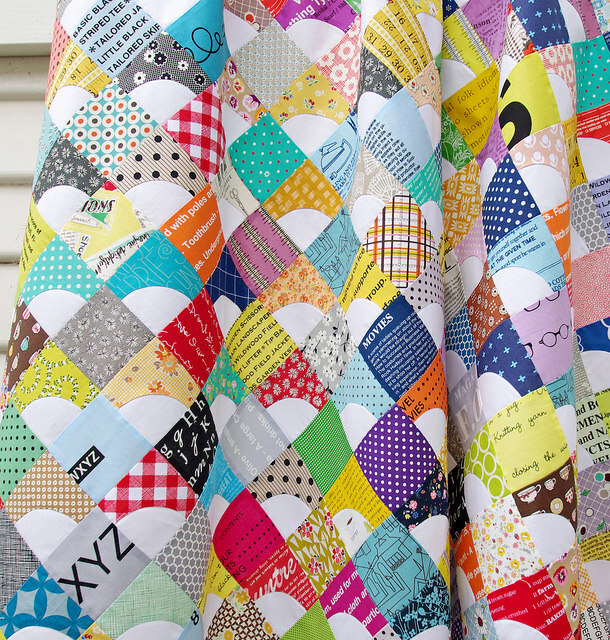 I really love this quilt and the fabrics you used. I was surprised you used such a small block size. I'm sure the smaller the block size the longer it took and being the block was so small I can see why it took longer than usual. I may try making this one myself to see how hard it it but yours really turned out great. Thanks for sharing it. 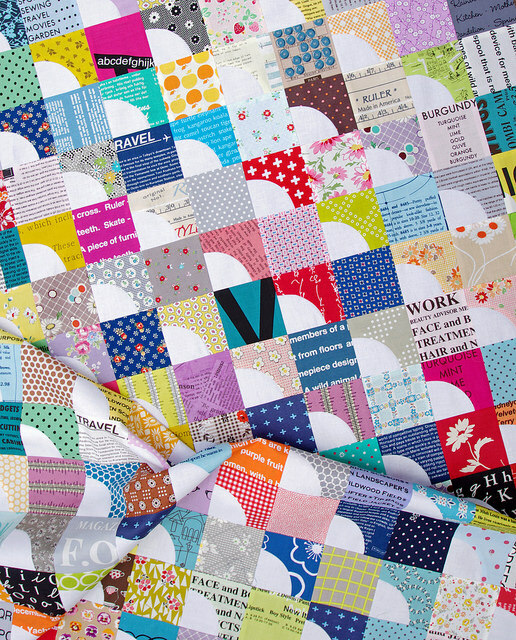 This quilt is stunning. 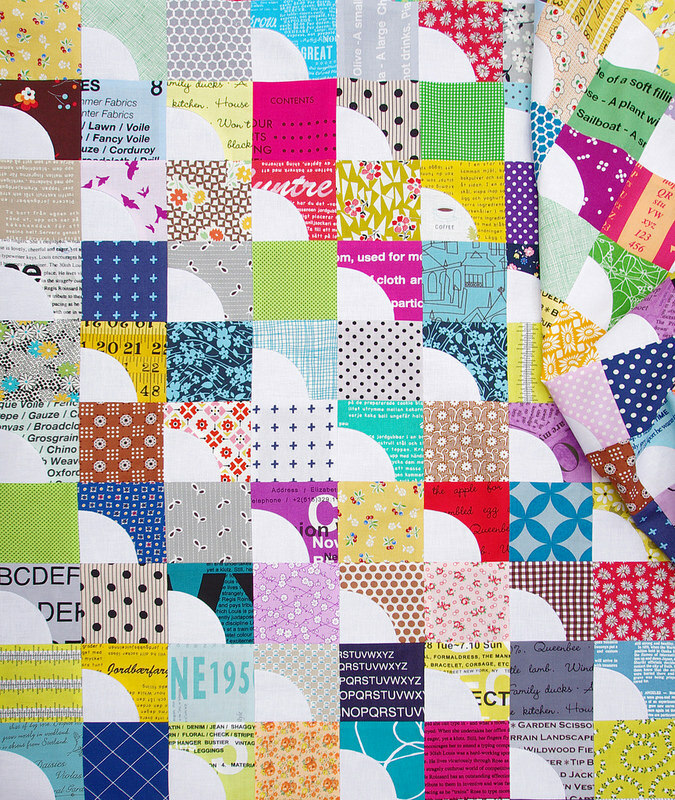 Love the use of those Japanese text fabrics, they really work so well in this quilt. It's the trimming down of all of those drunkard path blocks that gets to me ! So very time consuming! Well done. Love this qiult. Because your squares are so small did you use the method of sewing a circle on a square of fabric and cutting it in fourths? So happy I found your blog. I am new to quilting and have found your blog to be very informative and inspiring. Thanks so much!